them nor the years condemn. / At the going down of the sun and in / the morning we shall remember them. 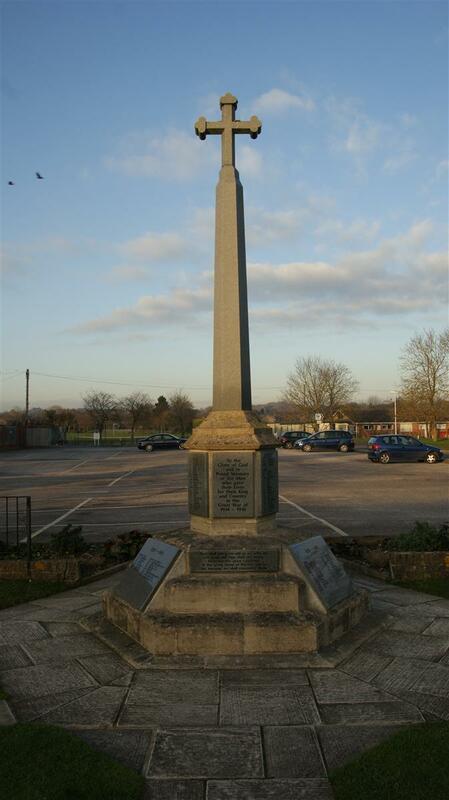 Thatcham War Memorial – Dedication Service, 11 Nov 1920. Thatcham honoured the memory of its gallant dead by assembling in large numbers at three o'clock on Thursday afternoon to witness the unveiling and dedication of the Memorial Cross erected in the Broadway to commemorate the names of those from the village who fell in the Great War. It was a simple but impressive ceremony, lasting about half-an-hour, after which the people made a close inspection of the memorial, laying many beautiful wreaths and bunches of flowers at its base. "To the glorious memoory of the Men of Thatcham, who, serving in the Royal Navy and in the Army, gave their lives for their country in the Great War, 1914-1918." "German howitzer captured by 1st Battalion Royal Berks Regiment, presented to the village of Thatcham as a tribute to the memory of 2nd Lieut A B Turner, of Thatcham House, who was awarded the VC for his gallantry at Fosse, near Vermelles, on 28th September, and died of wounds received there on 1st October, 1915." Before the unveiling ceremony took place, a service was held at the Parish Church, where prayers were offered by the curate, Rev A S Hazel; John S Arkwright's "The supreme sacrifice" was sung; and a short address was given by the Vicar, The Rev W S Grindle (Vicar of Cold Ash) was also present. Mr G J Fyfield, ARCO, was at the organ. With the verger at its head, a procession then wended its way from the church to the Broadway, where a large rectangle was formed. Behind the memorials stood the clergy and the united choirs of all denominations, also several of the gentry and villagers. Immediately facing the front of the cross in two ranks were ex-service men, who formed a guard of honour. In a prominent position in the foreground were two uniformed buglers of the Berkshire Regiment, Spencer and Durbridge. On the east and west sides were lined up children of the Council School, National School and Crookham School, under the supervision of masters and teachers; Girl Guides and Brownies, commanded by Miss Turner and Miss Pear MBE, and Boy Scouts with Patrol Leaders Fairchild and Turner in charge. Many relatives of the fallen and hundreds of villagers stood in reverent silence to watch the ceremony. The memorial cross was draped with two huge Union Jacks. "Father, we bring our dead to Thee. General Dickson then pulled the cord, and the flags enveloping the cross fell to the ground. Major Turner removed the flag covering the plate in front of the gun. The General Salute was sounded by the buglers. Prayers were read by the Vicar (Rev E Chamberlain). who then dedicated the cross, "To the honour and glory of God, and in memory of those whose lives had been given in the service of their King and Country." Other prayers followed, and the hymn, "For all the saints," was feelingly sung. The Blessing, the Last Post sounded by buglers, and the National Anthem brought the ceremony to a close. Haf-muffled peals were rung on the bells before and after the service. Amongst those present were Major and Mrs C Turner, Miss Tull, Mr A S B Tull, Mrs Branwell Davis, Mr and Mrs A Brown, Mr and Mres T H Brown, Mr J M Henry, Miss A L Henry, Mr W Draper, Mrs Wyatt, Mr and Mrs Skillman, Mrs Martin, Mr and Mrs Sheppard, Mr Harman, Mr J Lane, etc. A letter of apology for absence was received from Admiral Sir Srthur Fanshaw. The floral tokens placed on the memorial immediately after its unveiling on Thursday were from Thatcham House, Mrs Glastonbury, from School Teachers and Children of Church of England School, Organist and Choir, Clergy and others; from all at Coombe Lodge; Mr and Miss Tull and Mrs P Bramwell Davis, Miss Henry, Dr and Mrs T Martin, Bell-ringers, to F G Breach, Charles Powell, Cyril Rutter, Martin (from home), Arthur G Fisher, from wife; Mother, Sister and Emily. A Gibbs, Harold Rosier, Sig H Farley, F Marchant, Arthur Pinnock, to Jim; and others. Many other flowers have since been added.